Our standard line of enclosure solutions are fabricated using only the best grade steel. As quality driven steel fabricators our enclosures are versatile and highly adaptable, offering a vast range of sizes and various accessories to cater to your specific needs, whether as electrical enclosures or as industrial enclosures. All our electrical enclosures and industrial enclosures can be manufactured from mild steel, stainless steel and aluminium and have Ingress protection ratings of IP40, IP54, IP55 and IP65. As a standard, enclosures are powder coated in RAL 7032 Grey and B26 Orange, textured finishes and other colours are also available. The Dolphin series of stainless steel enclosures and the Perano series of mild steel enclosures are suitable for electric, hydraulic, pneumatic and various other applications in a number of industries mainly: electrical, electronic, mining and telecommunication. Enclosures are manufactured from 1,6mm – 2,0mm steel with a folded channel that provides stability and protection against dust and water. Mounting plates are fitted to all enclosures and powder coated white as a standard. Solid metal doors or a glass window with all-round flanges, a continuous extruded polyurethane gasket closing firmly against a self draining labyrinth, concealed hinges and 6mm square drive lock. 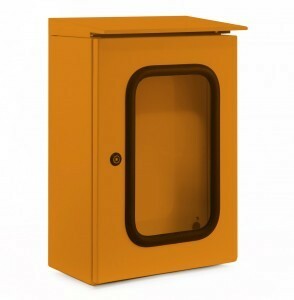 Enclosures can be pole or wall mounted. A modular, enclosure with unique features offering a vast range of sizes and various accessories that allow for customer configuration using standard elements, making the PB 1000 series of electrical enclosures the ultimate enclosure for all applications and all user requirements. The PB 3000 wall-mounted enclosure has been designed to house 19” equipment, electronic modules and data link modems. Manufactured in accordance with DIN 41494 and to industry standard heights of 9U, 12U and 15U. The PB 3000 floor standing enclosure are robust 19” floor IT equipment enclosures manufactured in accordance with DIN 41494. This range of 19” cabinets is manufactured to industry standard heights from 12U to 47U with widths and depths of 600 x 600mm and 600 x 800mm. All enclosures are fully adjustable, both vertically and horizontally. Our Motor Control Centers have been developed over 20 years into a modular and versatile panel. They are suitable for industrial and commercial applications, low and medium voltage motors, variable frequency drives, controllers and for metering.